90 ppm for reliable throughput that helps you transition from one job to the next with ease and efficiency. 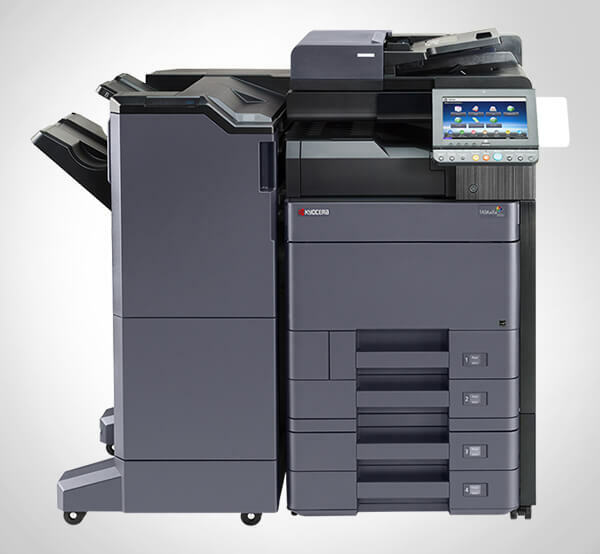 Users can consolidate tasks -including copying, printing, scanning and faxing -with the MP 9002 SP. Deliver first print times in as little as 2.9 seconds on a wide range of paper stocks without compromising space or your budget. Scan and print directly at the device using a USB memory or SD card, for exceptional convenience. Quota Setting allows administrators to set limits on output for individual users to curb excessive use. Add frequently used functions as icon shortcuts directly to the full-color, animated home screen. In addition, you can return to the home screen at any time with convenient one-touch operation. Access cloud-based solutions or Hot Spot printing quickly using the MFP Browser. Attach an external keyboard via USB cable for more user-friendly navigation. Enhanced Encryption Level (AES256bit, SHA-2) offers safer, more secure encryption algorithms. Plus, Bates Numbering provides identification protection and automatic consecutive numbering of documents. Overwrite all stored data on the hard disk drive with standard DataOverWrite and encrypt the address book, authentication information and stored documents using standard HDD Encryption. Print high-quality documents at high speeds. The versatile systems offer 1200 x 1200 dpi resolution. You can also preview PDF, JPEG and TIFF documents from a USB/SD card to minimize print errors. Schedule Print enables users to print larger jobs during off-peak hours to reduce network congestion. Use Auto Job Promotion to skip error print jobs. Choose from a variety of impressive finishing options to ensure end-to- end document production in more settings, from smaller offices to Central Reprographic Departments (CRD). Use the 3,000-sheet multi-tray finisher with 50- or 100-sheet staple capacity to expedite larger jobs. The 2,000-sheet finisher with saddle-stitch stapler can produce professional-grade booklets. Take advantage of hole punching, multi-folding option, a user-assignable 9-bin mailbox to produce high-quality, finished documents on a wide range of paper stocks and sizes. Enhanced Batch Scan lets users alternate between one- and two-sided scanning of original documents in a single job. The size of high-quality PDF files can be reduced significantly with JBIG2 compression support for faster, easier distribution. Users can save scans as digitally signed PDFs or in PDF/A format to protect the data more efficiently and securely. Scan full-color or black and white originals, access LDAP-registered directories and distribute a wide range of documents using scan to web-mail/e-mail/SMB/FTP/URL/NCP with incredible control and minimal effort. Scan to a USB/SD card right from the control panel - no PC is required. Users can send scans and faxes simultaneously to streamline distribution. Several services-led platform Ricoh devices can be connected to share phone lines helping to reduce costs further with the fax connection option. Faxes can be forwarded automatically to e-mail addresses, network folders or the system hard drive. With IP Fax (T.38) and Internet Fax (T.37), users can distribute documents directly to e-mail addresses for more costeffective delivery. Check, print, delete, retrieve, or download documents using your computer for paperless faxing that cuts steps and helps to reduce costs. Manufactured with electric furnace melted steel sheets. These sheets are made of 100% recycled steel, which help to reduce the consumption of environmental resources. Ricoh is the first manufacturer to incorporate this process. Users can visualize cost and paper resources by displaying the Eco-Friendly indicator, showing the percentage of paper reduction achieved. 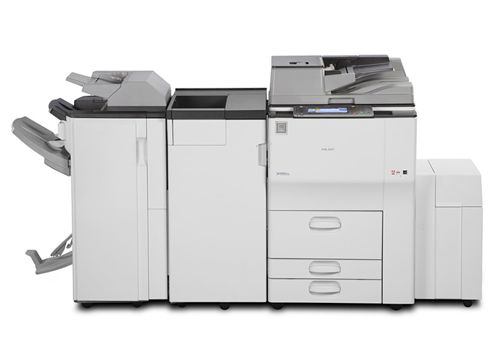 This compact MFP is designed with default duplex printing to reduce paper consumption significantly. Streamline fleet management with intuitive, unobtrusive administrative controls. Reset print volume counters automatically to manage excess print and copy costs for individual users or workgroups efficiently. Import and export preference settings - including applications, system settings and shortcuts - from other Ricoh services-led platform devices for fast, convenient deployments. Identify up to 1,000 user codes to check usage and status via SmartDeviceMonitor. Use banner page printing to separate print jobs to determine who printed each job. Use WebSmartDeviceMonitor from any web browser to configure and diagnose network devices remotely. Easy to use @Remote software automates service calls and simplifies the collection of critical device data. Administrators can receive email alerts to ensure that devices are replenished with supplies promptly. They were painstakingly thorough in analyzing our copy machine needs and the solutions to address our copy needs. I was truly impressed with the executive summary they presented . . .